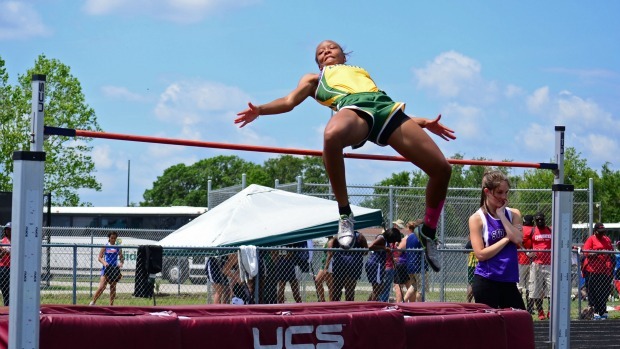 It’s the beginning of the playoffs for track & field in Florida. As the 1A & 2A schools are looking at Regional meets, class 3A & 4A are just getting started with their respective district meets. 3A District 5 took place Thursday afternoon at St. Cloud High School; which did an awesome job hosting, their hospitality makes this a great venue to host top notch meets throughout the season. 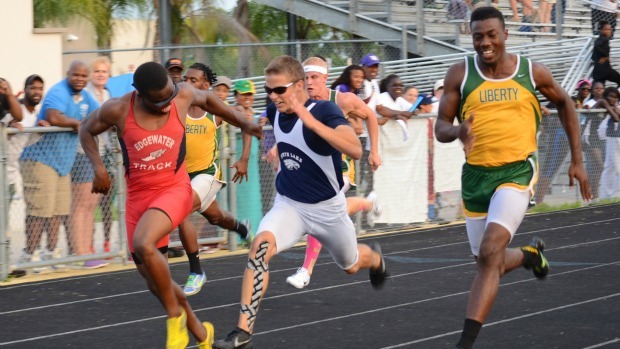 Twelve local teams took to the track to battle for the right to represent their schools in Tampa next week. On the girl’s side, Evans looked like the team to beat before the spikes were even laced up, but in the playoffs, you have to bring your A game, and that’s exactly what they did. Some other outstanding individuals include: East Ridge freshman sensation Kaylin Whitney did not disappoint as she took the 100 ( 11.91 ) & 200 ( 23.91 ) in easy fashion, winning both by comfortable margins. 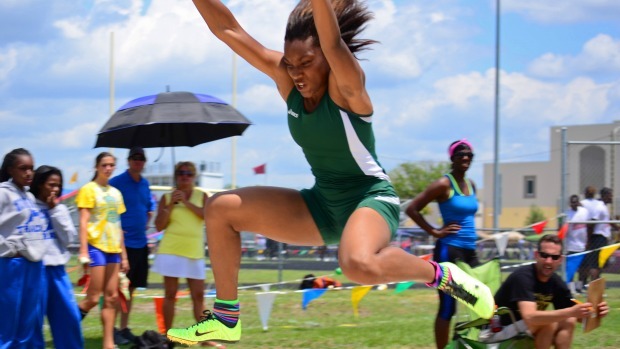 She was also on the 4x400 squad that advanced to Tampa by taking fourth. Liberty senior Kadijah Brown scored 26 points as she qualified for regional’s in all 3 jumping events. 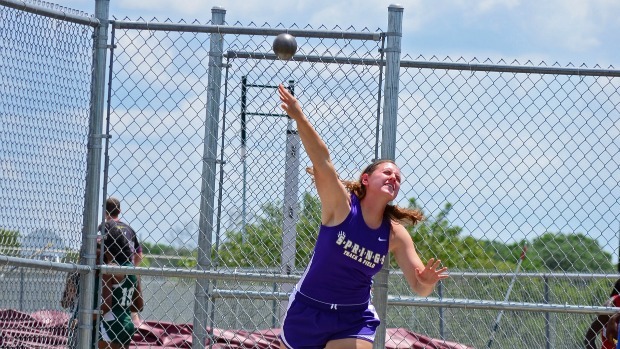 Winter Springs senior Rebecca Evans took the shot put and discus titles and earn 20 points for her team. She goes to Tampa as the Favorite in both events. Coming fresh off their Orange Belt Conference win a few weeks back, The Liberty boys came in as the “on-paper” favorites. 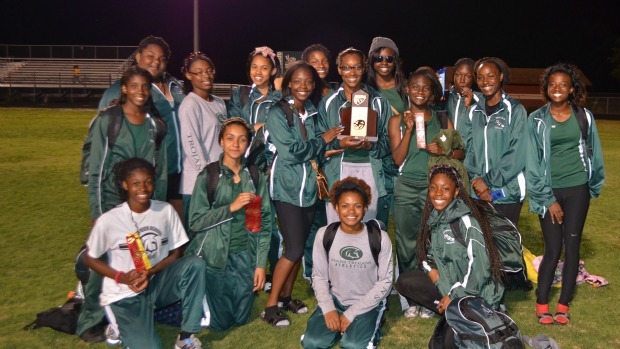 They showed up big and are sending a host of athletes to Tampa for next week’s regional meet. They took first, scoring an impressive 164 points. For individual honors, Wallace Swift and Marshall Nunn were back at it to battle for sprinting supremacy, but there was a new kid on the block in sophomore Devarius Turner from Liberty High School. The trio faced each other at the Disney Showcase just over a month ago, and this matchup gave us exactly what we hoped it would. They dueled in the 100, 200 and they anchored their respective teams in the 4x100 relay. Swift took the 100m, but Tuner took the 200 and 4x100. They all qualified for the regional meet in all three events, except Swift, who missed out in the 200. 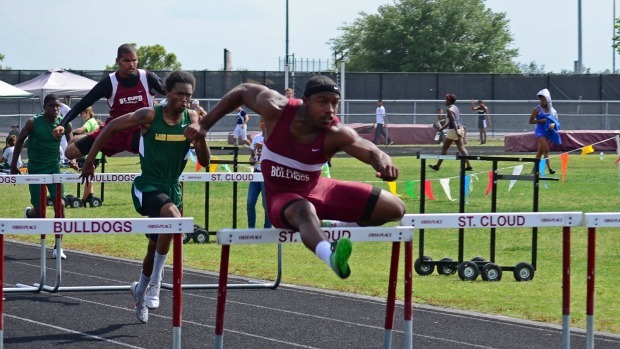 St cloud Senior Trayvon Williams had another huge meet to lift his team to a second place finish. He took both hurdle titles and anchored the 4x100 squad to a second place finish. He also took second in the long jump. They broke the school record back at their home invitational in February during the prelims, and have been in that 41 second window several times since. Ian Mckenzie also contributed 20 points to the cause with a double win in the throwing events. 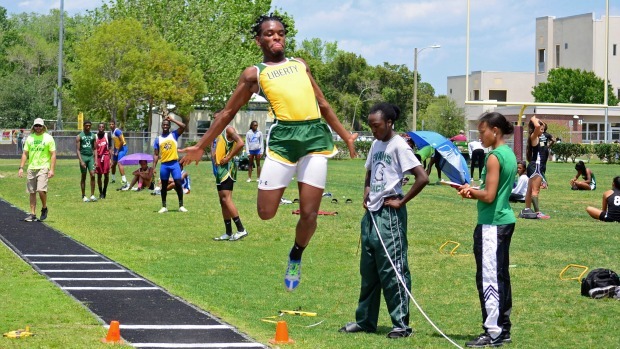 Liberty senior Joshua Wilson was ready to make a run to the state meet. He has been an integral part of Liberty’s undefeated regular season. He scored big today in winning the long jump, the lead leg on the winning 4x100 team, and earning points in both the 100 and 200 meter races. In the end, Evans scored 144 points, 54 points more than the nearest team. They looked poised to make a serious run at the regional crown next week at Leto HS in Tampa.Oak Ridge was second and Osceola was third. The Liberty boys also dominated with an outstanding 163.5 points. St. Cloud and Evans round out the top three.